Indian architects, Studio Mumbai, are attracting international attention for the integrity and imagination of their projects. 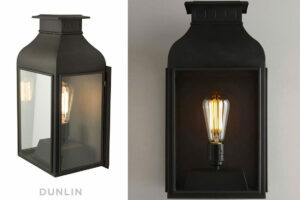 Here, Kerstin Rose is taken through a recent project and introduced to how the practice thinks. Hero Image: The living area in the backside of the building is connected with the sleeping rooms by a gallery in the first floor. 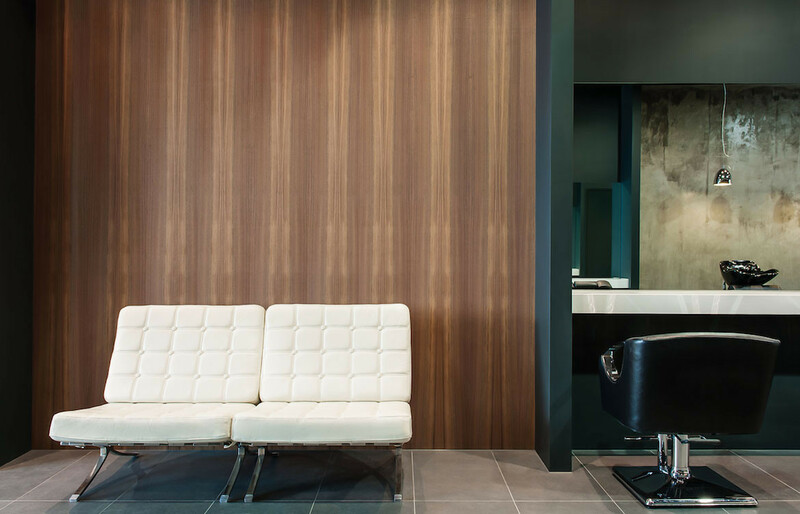 The passage way interrupts the building and gives it a lightness. The house is unbelievable. 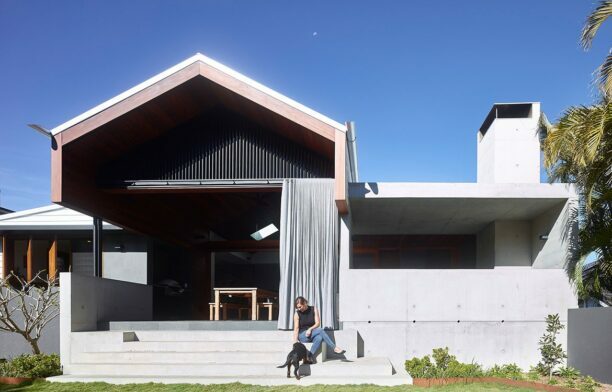 Its narrow frontage makes it barely noticeable from the road, the elongated body of the house behind it is almost totally concealed by the branches of mango trees, and the back body of the house snuggles up inconspicuously to a rock wall. 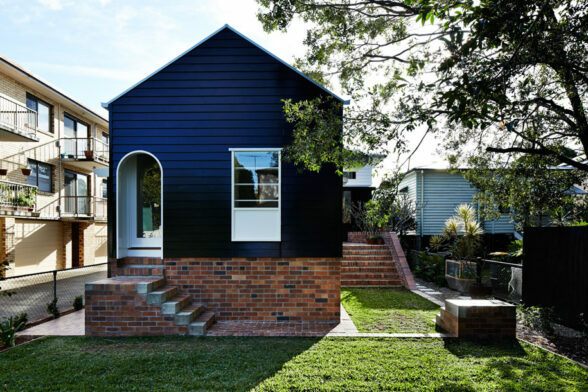 The true size of the place – it contains 350 square metres of living space – does not become apparent until one strolls through its bright, quiet rooms. Entrance to the living area. The terrace stones are rocks from a little river nearby. 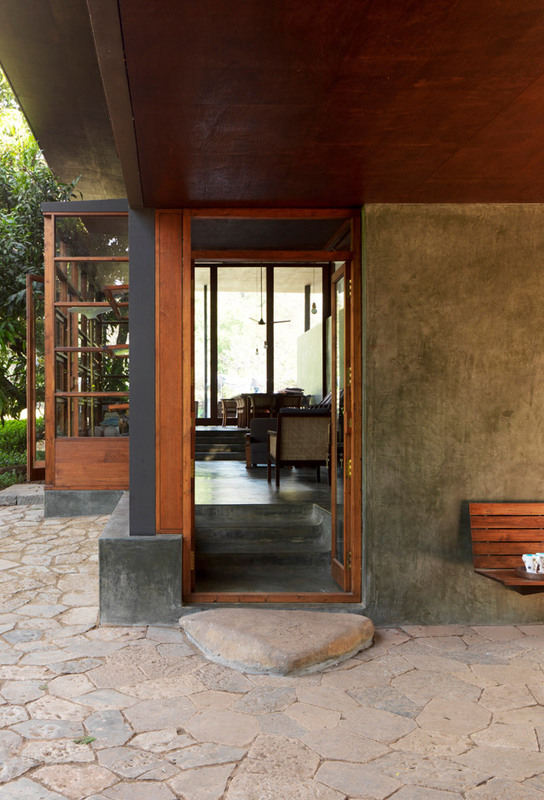 Before Bijoy Jain sits down to design a house, he makes a comprehensive and detailed study of the surroundings in which it will be situated. The Belavli House was no exception. He made an extensive survey of the local landscape, observed the course of the sun, and measured the amount of groundwater on the land; he included every single tree and hill, every single hollow and rock formation in his planning. View to the dining room in the living area. 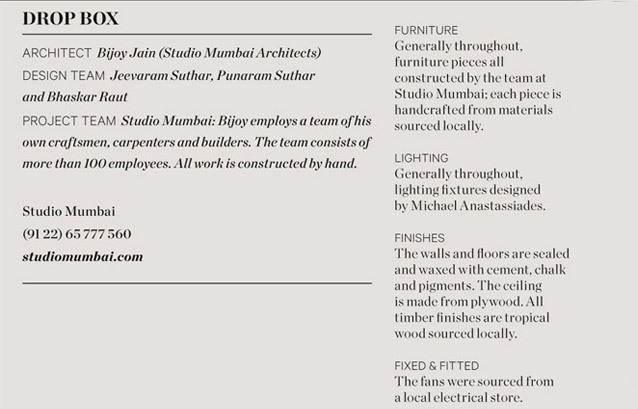 All furniture is made by Studio Mumbai. 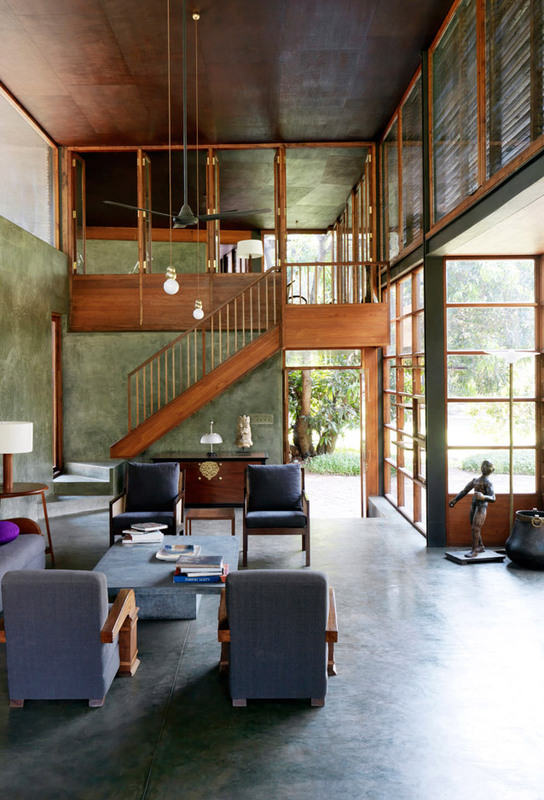 The window front and green walls give a feeling of being part of nature. The architect feels something verging on disgust when he thinks of the thoughtless manner in which building projects are carried out in his country. In Mumbai’s hinterland, entire ranges of hills are being opencast mined out of existence in order to provide raw materials for large-scale construction projects in the financial metropolis. Devastated landscapes and destroyed villages are all that are left behind once the mining work is over. Sustainability and ecological awareness still have no significance in booming India. From the living room the stairs go up to the gallery, where the owners listen to music or play cards. 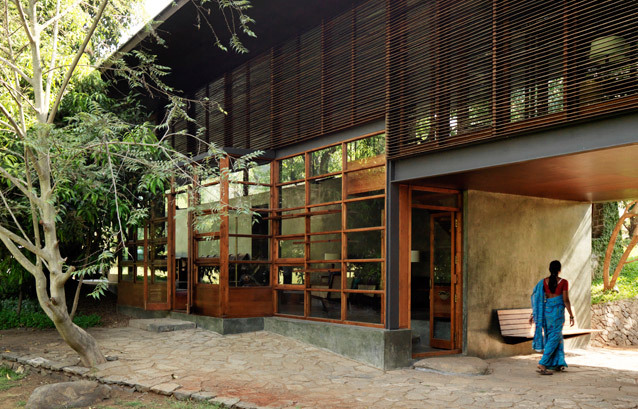 All installed joinery, including staircase and windows, is made by Studio Mumbai. The ceiling is made from Plywood. 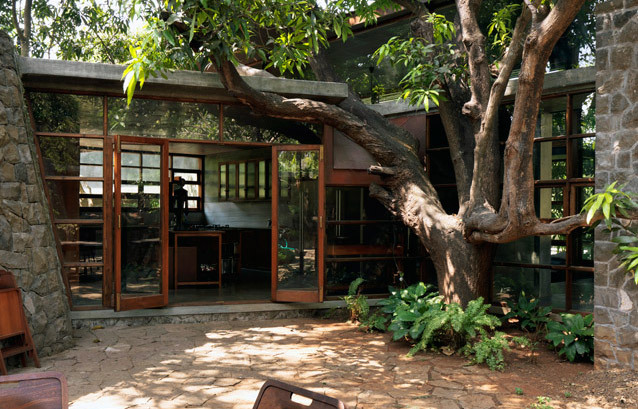 View from the patio into the kitchen, built around a mature mango tree. 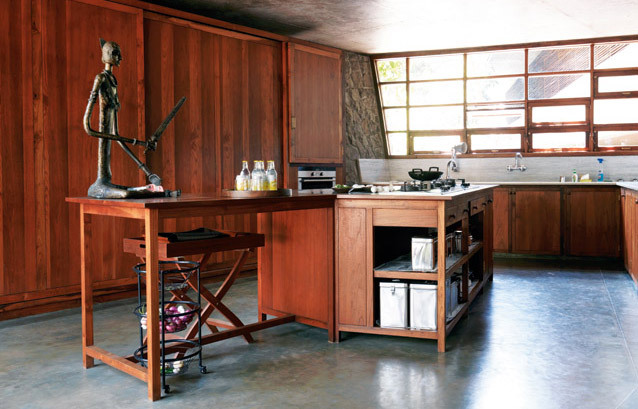 The complete kitchen was built by Studio Mumbai. The back left corner of the rom is sloped/slanted because of another mango tree which came along. A gravel road leads past fields on the way to Beirola, a small and – by Indian standards – prosperous village. Women and children sit by the village well washing dishes. Every stone dwelling has its own vegetable garden. The Belavli House is situated at the end of the village. Only when seen in the context of the village does it become clear just how inconspicuously the house blends in with its surroundings. From the road, it seems no bigger than the neighbouring farmhouses and beans and courgettes grow in the garden. The garden is tended by a family that also act as caretakers in the textile manufacturer’s house. Guest rooms in the extra pavilion. Situated on the estate a little way off from the main house are two guest pavilions. In the front part of the main house, which leads to the gravel road, are two bedrooms. The heart of the estate is a 5.5-metre-high hall in the rear part of the elongated body of the house. Sliding windows that extend to the floor open the hall to the north and west. 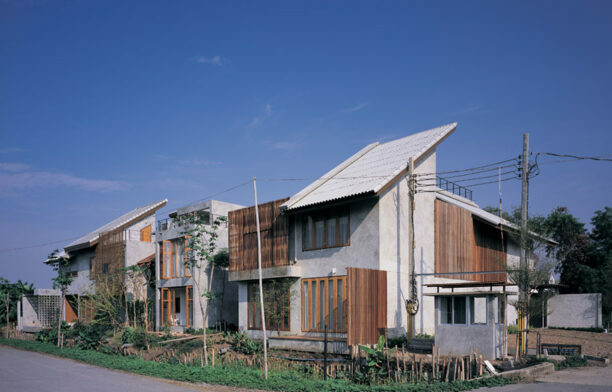 The flat extended roof provides shade in the summer and shelter from the torrential monsoon rains. 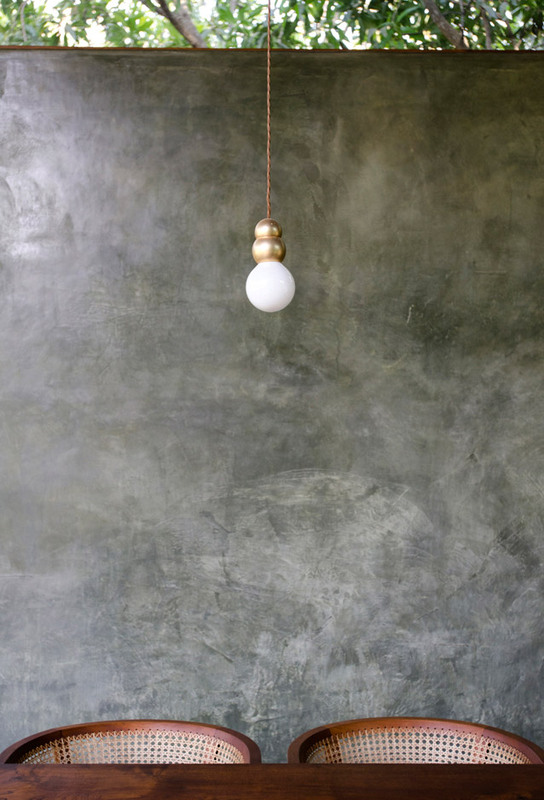 As in all buildings designed by Bijoy Jain, the walls and floors of the Belavli House are sealed and waxed by a seamless coating of cement, chalk, and pigments. They shimmer in a shade of green that corresponds to the colour of the mango leaves that press against the window panes. Despite the glazed walls, one’s gaze does not leap straight outside, but wanders there in stages, quickly negotiating the four steps up from the living area and into the dining room, then sliding past trees, encountering a mustard field that blossoms yellow in the springtime, before finally sweeping across to the range of hills on the horizon. 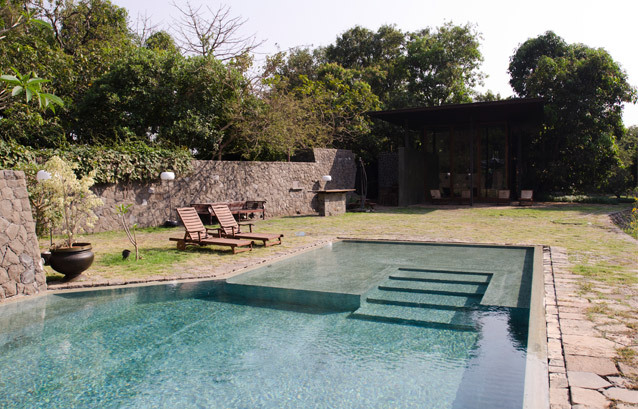 Bijoy Jain knew exactly what he was doing when he created this dramatic, dynamic way of seeing. For him, there is nothing more boring than a panoramic view. “Panoramas distract our attention from the interior,” he says ambiguously. He wishes to draw our attention to the obvious, the close at hand, to details. And at the Belavli House these are, first and foremost, trees. Some of the windows almost seem to magnify the intricate patterns of branches and leaves outside them. The gardner watering the plants. 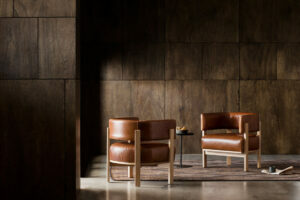 The 46-year-old sees his projects as attempts to achieve a unity of architecture, interior design, and surroundings. And he likes to have this unity under complete control. 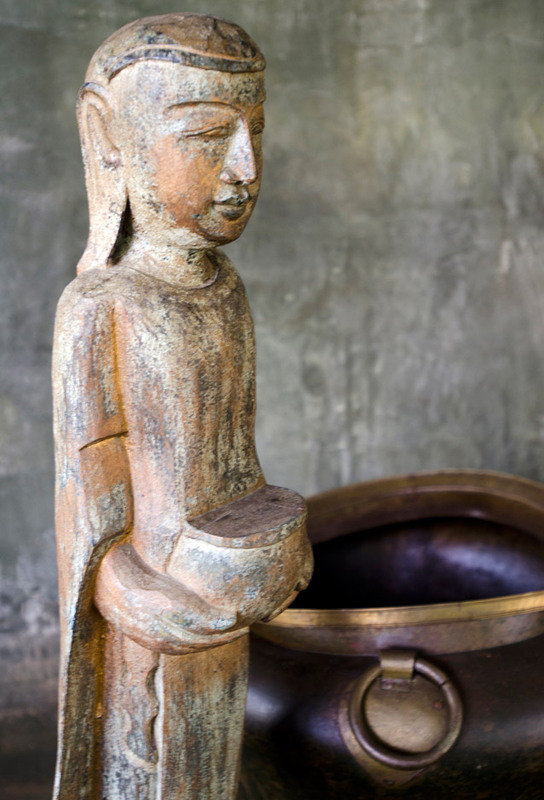 Whenever Jain accepts a commission to design and build a house, everything that goes into the construction of the house comes directly from him. Several years ago, he established a ‘Campus for Living and Working’. In the jungle-like compound are shacks for his workers, his own private residence, and an open structure consisting of steel girders and a corrugated iron roof. Beneath this roof, practically in the open, half a dozen architects and interns from all over the world are bent over their laptops, which are connected to the World Wide Web via W-LAN. Right alongside them crouch workers who make by hand whatever the boss needs for his buildings: windows, walls, furniture, doorknobs, handles. Even the toilet roll holders come from the campus. 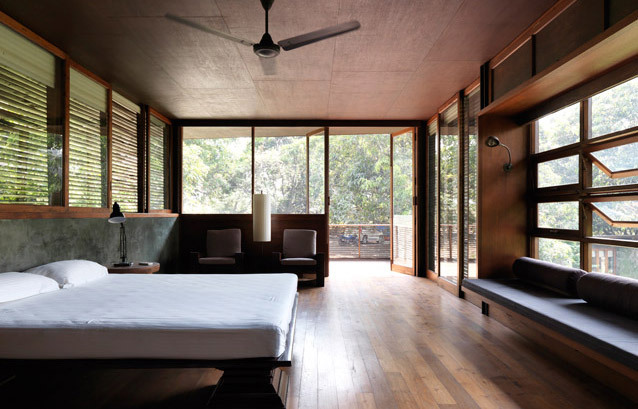 Close to the Belavli House, Bijoy Jain has recently divided up a hillside into parcels of land. 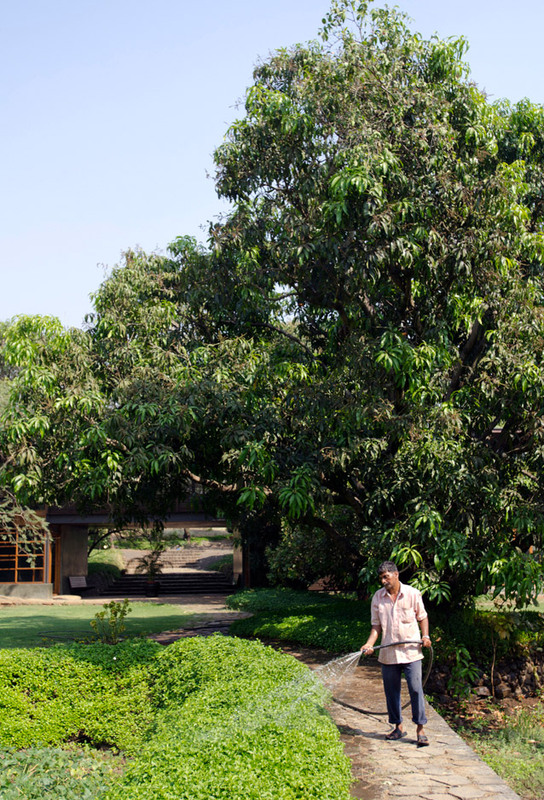 Next to his own home and the workshops he plans to build more genuine ‘Jains’ – that is, environmentally friendly buildings of wood and cement. 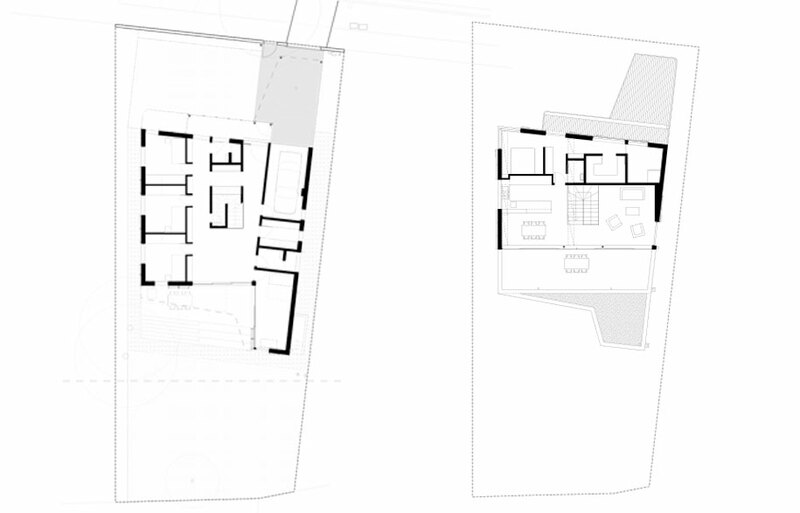 They will all be radically different from each other: Structures will be piled up on top of one another or be slotted together; exits, bulges or terraces will be situated in places where clients wouldn’t normally expect to find them. Nature, however, will “always be the guide, with trees providing a natural limit”. 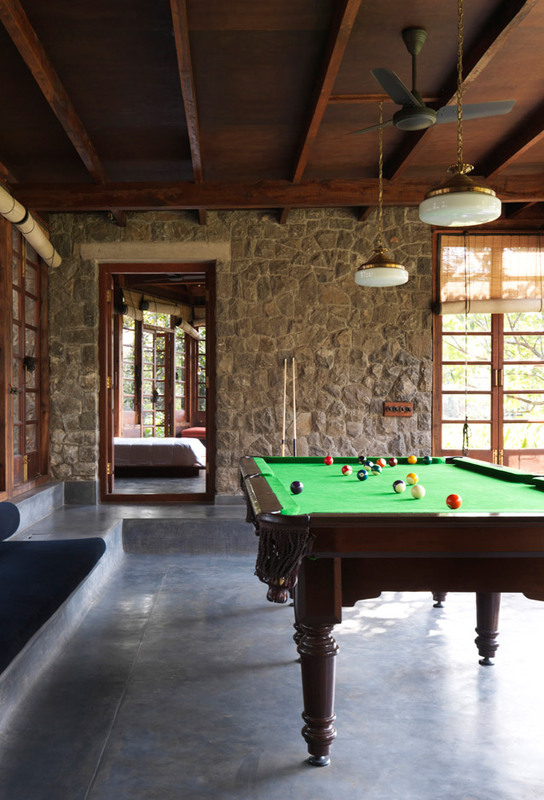 Very British: in one pavilion near the pool there is a billiard room. Sleeping room of the house owner on the first floor. 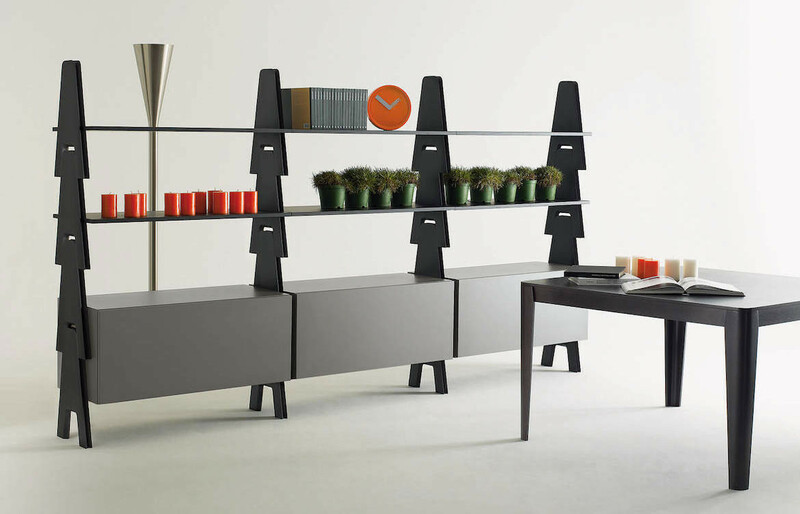 A passage of wind and a ventilator enable a natural cooling pattern, rather than an air conditioner. 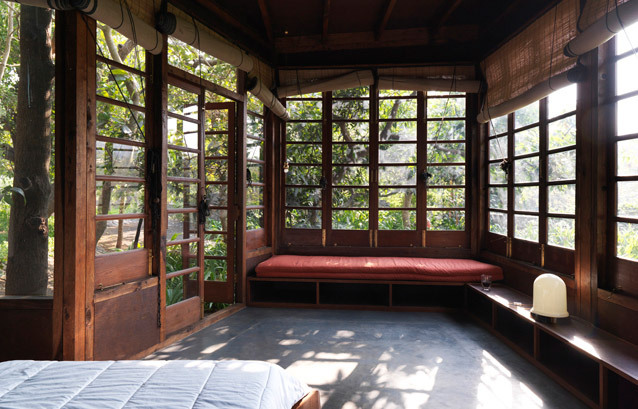 Anyone who commissions Bijoy Jain to build a house for him must be able to make compromises. The master doesn’t make any. 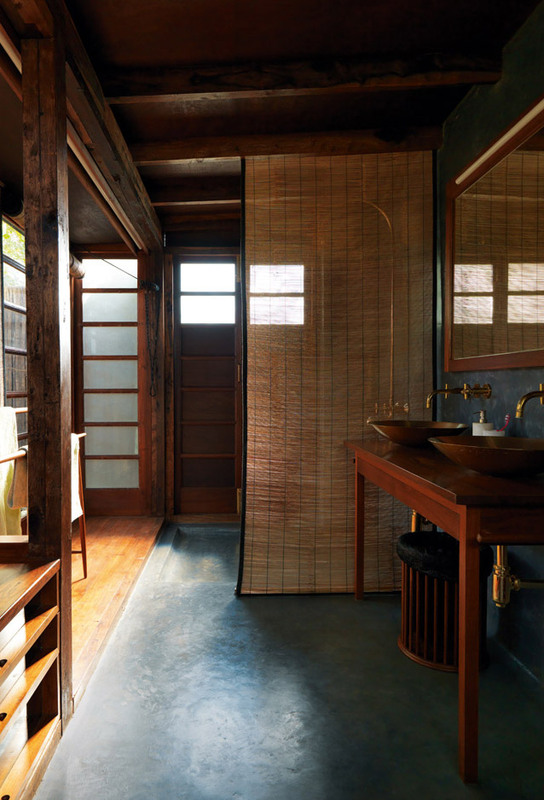 One of the bathrooms, with all fittings made by Studio Mumbai, even the water taps. The pool in a separate garden area of the house.